The Winchester Cultural Council is a group of volunteers, appointed by the town's Select Board, who work to serve the artistic and cultural life of the town. The State of Massachusetts, through the Massachusetts Cultural Council, gives Winchester a grant of money each year to support the arts, humanities and interpretive sciences. The WCC then awards this money to local individuals and groups who have submitted grant applications. Calling artists, performers, and other cultural creators! Join the Winchester Cultural Council's online directory of artists by completing our registration form. 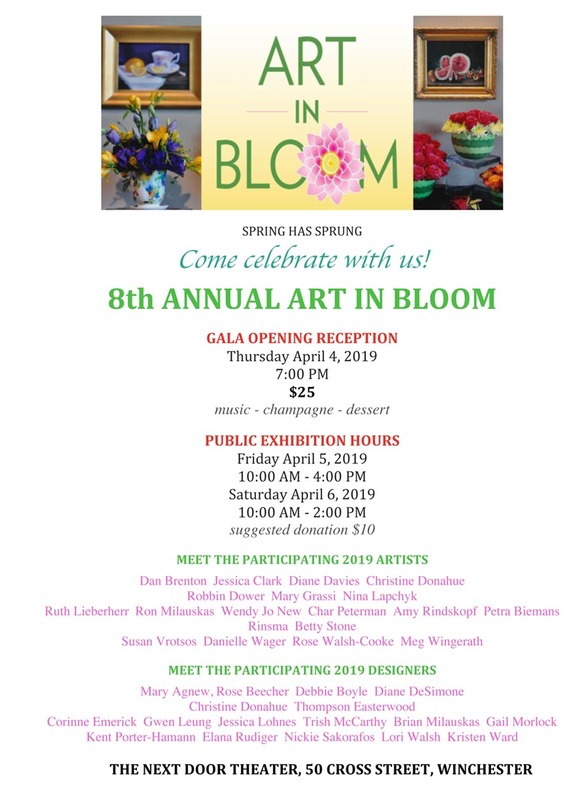 Come to the 8th annual ART IN BLOOM at the Next Door Theater, 50 Cross Street in Winchester. Art in Bloom is a floral "fun-raising" event that features more than 30 local artists & community designers. It opens with a Gala Grand Reception on Thursday April 4, 2019 at 7:00 pm, featuring music, champagne, and dessert (tickets ​$25, available at BOOKENDS and at the door). Participating artists include Dan Brenton, Jessica Clark, Diane Davies, Christine Donahue, Robbin Dower, Mary Grassi, Nina Lapchyk, Ruth Lieberherr, Ron Milauskas, Wendy Jo New, Char Peterman, Amy Rindskopf, Petra Biemans Rinsma, Betty Stone, ​Susan Vrotsos, Danielle Wager, Rose Walsh-Cooke , and Meg Wingerath. Participating designers include Mary Agnew, Rose Beecher, Debbie Boyle, Diane DeSimone, Christine Donahue, Thompson Easterwood, Corinne Emerick, Gwen Leung, Jessica Lohnes, Trish McCarthy, Brian Milauskas, Gail Morlock, Kent Porter-Hamann, Elana Rudiger, Nickie Sakorafos, Lori Walsh, and Kristen Ward. The Winchester Cultural Council has awarded $5,200 in LCC grants to 10 individuals and organizations for 2019. The funded projects expand cultural opportunities for Winchester’s students, help Winchester residents hear distinguished local performers, and use art to celebrate and strengthen our community. 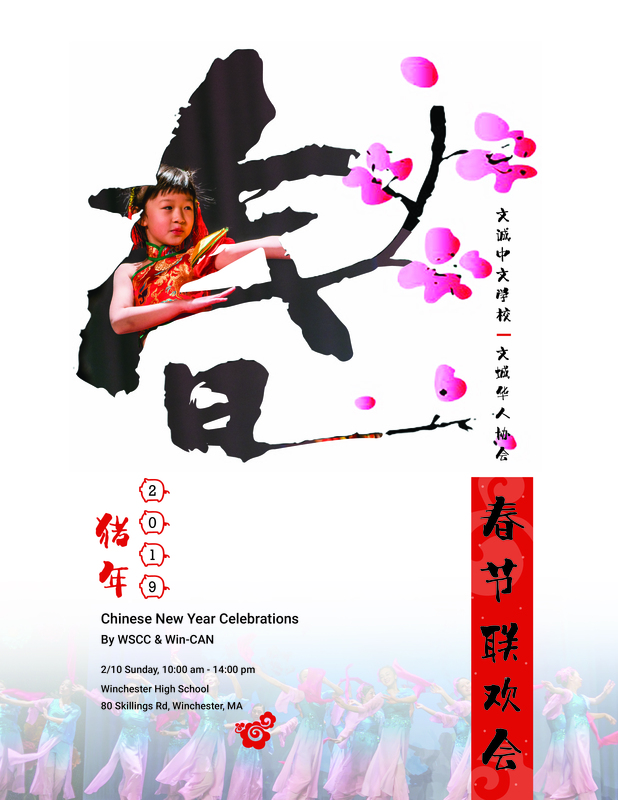 Projects include Indian Dance and Peking Opera; the extremely successful Authorfest program that brings published authors to Winchester schools; a new monthly studio arts series in a collaborative community space which is free and open to anyone in Winchester; and a program in March with WZLX radio DJ and author Carter Alan on his new book, which includes performances by several rock ensembles from the Winchester Community Music School. In addition, funding supports continuing the summer Concerts on the Common, the "Just a Minute" online video festival, and arts and literacy enrichment programs. On this Columbus Day, many are urging that we also remember America's indigenous people, the "Indians." Winchester has an explicit connection to the original residents of our area through our town nickname, the Sachems. A sachem (or sagamore) was a chief, leader, or king of the native peoples. Winchester's adoption of the name was particularly due to a woman, "Squaw Sachem," who was queen of the local indigenous tribes and the widow of Nanepashemet, who once ruled lands stretching from Weymouth north to Portsmouth, N.H., and as far west as Northfield. Sachem Nanepashemet was killed in 1619, in Medford, fighting Tarratines (Abnakis) who had invaded from Maine, leaving his wife, three sons, and a daughter. Squaw Sachem and her sons were notably friendly with the English colonists and generally allied with them. Her people, however, were decimated by war and plagues mostly associated with the European settlers—including smallpox, which killed two of her sons, Sagamore John (Wonohaquaham) and Sagamore James (Montowampate) in 1633. In 1638 Charlestown granted its citizens permission to settle land to the north, including Winchester, accelerating a movement that had already been occurring. Around that time Squaw Sachem sold her land in and around Winchester to settlers, reserving the right for her people to live, hunt and fish there during her lifetime. The sale is memorialized by the WPA mural above the circulation desk in the Winchester Public Library. Squaw Sachem's favorite residence was probably on the west side of Upper Mystic Lake, near Winchester Country Club, where there was a "Squaw Sachem spring" that was visited by her people for many years after her death. Herbert Meyer Brook on Myopia Hill was originally known as "Squaw Sachem stream." The story of Squaw Sachem is a great lesson in local history, and is one illustration of the complex interactions between the native inhabitants and the immigrants who went on to create our modern landscape—laying the groundwork for the many new immigrants who continue to arrive here. It is interesting, too, to note that Winchester's "native American" nickname memorializes a relationship with a particular individual, a relationship that was notable for peace and friendship. Finally, in this day and age, it is worth celebrating that that individual was a woman—one of power, grace and fortitude. More information about Squaw Sachem and the selection of the "Sachems" nickname (which dates only from the early 1950s) can be found at "The Sachems of Winchester" on the Popular Topics in Winchester History page on the town website. Mark your calendars and plan to attend these events in the Summer and Fall of 2018, all supported by grants from the Winchester Cultural Council! ★ "Generations of Fun: A Grandparents' Day Celebration" with storyteller and singer Davis Bates at the Jenks Center on September 9, 2018. All grandparents, grandchildren, and their friends are invited. ★ Folktale Puppet Shows: "Immigrants, Past and Present" on the Winchester Common at "International Day at the Farmer's Market", September 29, 2018, presented by the Ethnic Arts Center. ★ The Mass. Memories Road Show comes to Winchester on October 20, 2018. Sponsored by the Winchester Archival Center; specific details are forthcoming. The Winchester Cultural Council has awarded $5,583 in LCC grants to 10 individuals and organizations for 2018. The funded projects expand cultural opportunities for Winchester’s young students and senior citizens, help Winchester residents hear distinguished local performers, and use art to celebrate and strengthen our community. Projects include a documentary film, "The Greening of Winchester"; two special events at the Jenks Center; a classical Indian dance performance in the fall; the Family Farm Night Music Series at Wright-Locke Farm on summer Thursday nights; a family concert on the Common by by Roger Tincknell; special puppet shows at the Farmer's Market's International Day in September; arts enrichment programs for children at Lincoln School and those attending after-school programs; and the Mass. Memories Road Show on October 20. The Winchester Cultural Council is in need of new members for the coming year. Cultural Council members are volunteers who are appointed by the town's Select Board; love of the arts is important, but no special skills are required. The Council meets monthly, gives cultural grants annually, and provides many opportunities to enrich our town. To apply, send a letter stating your interest to the Select Board at Town Hall.